Senior forward Connor Riley scored a career-high 24 points and grabbed nine rebounds to lead Platteville to a 51–42 victory over Prairie du Chien last Thursday night. POSTED December 20, 2018 12:01 p.m.
PLATTEVILLE — Platteville’s Connor Riley couldn’t have picked a better night for a breakout game. 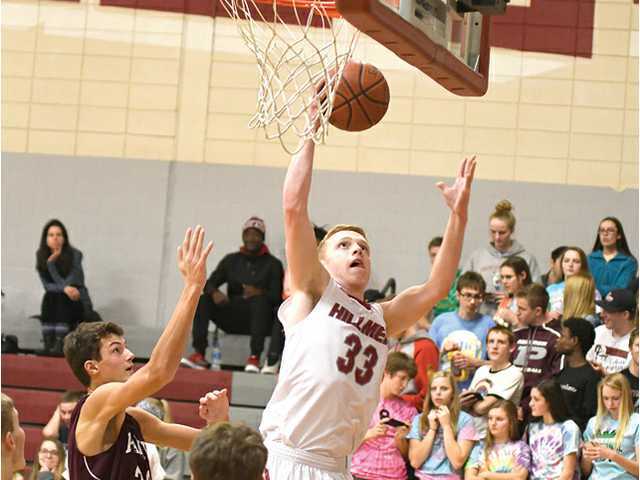 Riley dominated Prairie du Chien senior Hunter Davis, scoring over the 6-foot-7 senior time and time again to the tune of a career-high 24 points to lift the host Hillmen to a key Southwest Wisconsin Conference victory over the visiting Blackhawks last Thursday night. Riley connected on 10 of 15 shots form the field, many of them on right handed jump hooks, and made all four of his free throws. He also grabbed a team-high nine rebounds for good measure as the defending conference champion Hillmen improved to 2–0 in the SWC to remain in a first-place tie with River Valley (3–2, 2–0 SWC). Riley, who was an honorable mention All-SWC pick a year ago, scored six of Platteville’s first 13 points to the Hillmen grabbed an early 13–9 lead. His basket with 4:36 left in the opening half made it 19–13, but the Blackhawks closed the half on a 9–2 run to nab a 22–21 lead. Josh Dyer scored the first basket of the second half for Prairie du Chien, but Riley, classmate Cade Rohrbach and the Hillmen took over. Rohrback hit a 3-pointer from straight on to tie the game, then scored on a driving layup with 16:41 left. Then, Riley scored eight straight points — all of them over Davis — to cap a tie-turning 13–0 Platteville run. He scored on a layup on a nice feed from Rohrbach, then converted right-handed jump hooks from the left block on back-to-back possessions. After teammate Brandon Wiegel grabbed an offensive rebound, Riley scored on a spinning jump hook in the middle of the lane with 11 minutes remaining to make it 34–24. Rohrbach banked home a 3-pointer with 7:25 left to ignite a separate 15–3 Platteville run that pushed the lead to 51–32 with 3:55 left. Riley had a pair of three-point plays in the run, and Rohrbach twice converted in traffic on driving coast-to-coast layups. Rohrbach finished the game with 16 points, on 7 of 8 from the field, seven rebounds and two steals. Senior Isaiah Oswald chipped in seven points and five steals, and Huser mentioned fellow senior Andy Eggers’ strong defensive play and five assists despite going scoreless in the win. “Cade has a unique ability to come up in the clutch for us and he has done that over his career,” said Huser. “I thought he picked his spots to be really aggressive on offense against a really good defender in Mason Kramer and he made some big baskets when we needed them the most. I think at times we take for granted how much we put on his plate, but he handles everything extremely well. It’s just one game, but Prairie du Chien, who defeated the Hillmen in both meetings a year ago, is expected to be Platteville’s top competition for this year’s conference title. Saturday night, Platteville eked out a 53–51 overtime victory over visiting Columbus and its head coach Ben Schambow, a 1997 graduate of Platteville High School. The teams entered overtime tied at 47–47. A basket by Trey Bartels and a pair of Oswald free throws gave the Hillmen slim lead in the extra session, and Platteville finally got some breathing room and a 53–48 lead with 10 seconds left on a basket by Wiegel. Ben Emler hit a inconsequential 3-pointer to complete the scoring. Emler finished with a game-high 22 points to lead the Cardinals (5–2), who suffered just their second loss of the season. Oswald finished with 13 points and three assists, and Rohrbach added 12 points, four rebounds and three assists to lead the Hillmen. Eggers tallied eight points, and Riley and Bartels scored seven apiece. Wiegel finished with six. “I think it is safe to say that we are a tested team early in the season,” said Huser. “I could tell early that the three-game week had us a little bit sluggish, but our guys really persevered and showed some grit late in the second half and in overtime. We had to battle back from a four-point deficit late in the game and kept our composure throughout. We know we have to keep improving and get some areas cleaned up, but the kids are working on them and because we have great chemistry on this team, everyone is doing their part to get better. The Hillmen (5–2) are now off until after Christmas when they host Clinton on Thursday, Dec. 27 at 8:15 p.m. as part of the Platteville Holiday Classic. Platteville will then host Antigo on Friday, Dec. 28 at 3:15 p.m.
Prairie du Chien (2–1, 1–1) — Gavin Gillitzer 5, Mark Welter 5, Mason Kramer 10, Josh Dyer 4, Ryan Thein 1, Hunter Davis 19. Totals – 12 13-21 42. Platteville (4–2, 2–0) — Cade Rohrbach 16, Isaiah Oswald 7, Brandon Weigel 2, Connor Riley 24, Trey Bartels 2. Totals – 22-44 4-9 51. 3-point goals — PdC: 5 (Gillitzer 1, Welter 1, Kramer 3), P: 3 (Rohrbach 2, Oswald 1). Team fouls – PdC: 14, P: 16. Fouled out – P: Riley. Columbus (3–2) — Caden Bieker 9, Adam Zahn 3, Alex Campbell 4, Will Cotter 2, Trent Casper 11, Ben Emler 22. Totals – 15 16-19 51. Platteville (5–2) — Andy Eggers 8, Cade Rohrbach 12, Isaiah Oswald 13, Brandon Weigel 6, Connor Riley 7, Trey Bartels 7. Totals – 20-49 8-12 53. 3-point goals — C: 5 (Bieker 3, Zahn 1, Emler 1), P: 5 (Eggers 2, Oswald 3). Team fouls – C: 16, P: 24. Fouled out – P: Bartels, C: Casper.